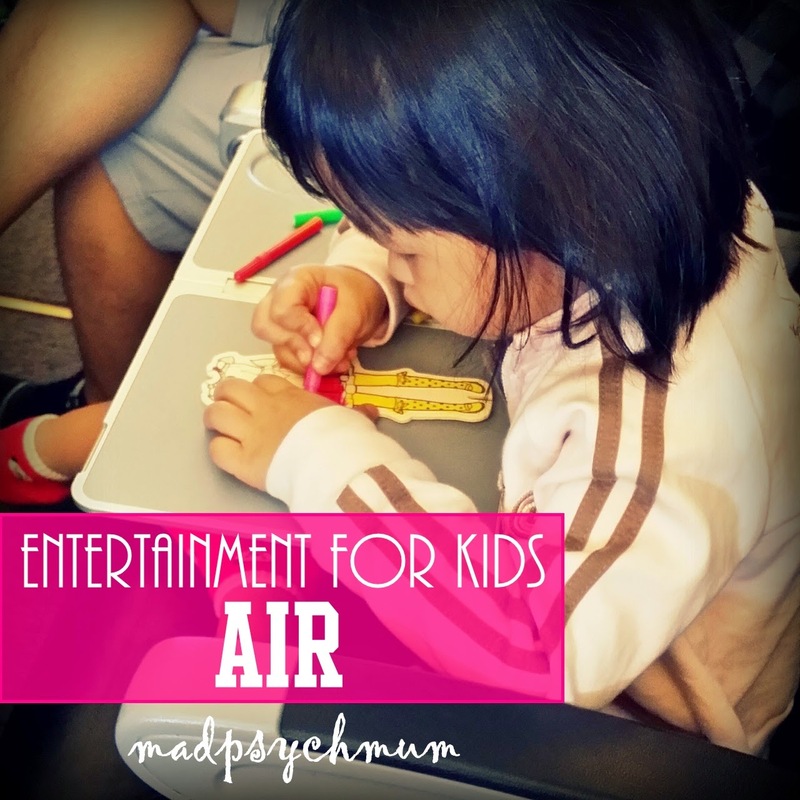 All of us know that the greatest challenge with bringing the kids with us on a trip overseas, be it by plane, car or bus, is finding ways to entertain our kids during the journey where they are confined in a small space and have nowhere to go. After a while, they start complaining, whining, crying and asking, "are we there yet?!?" and it can drive us insane. True story. 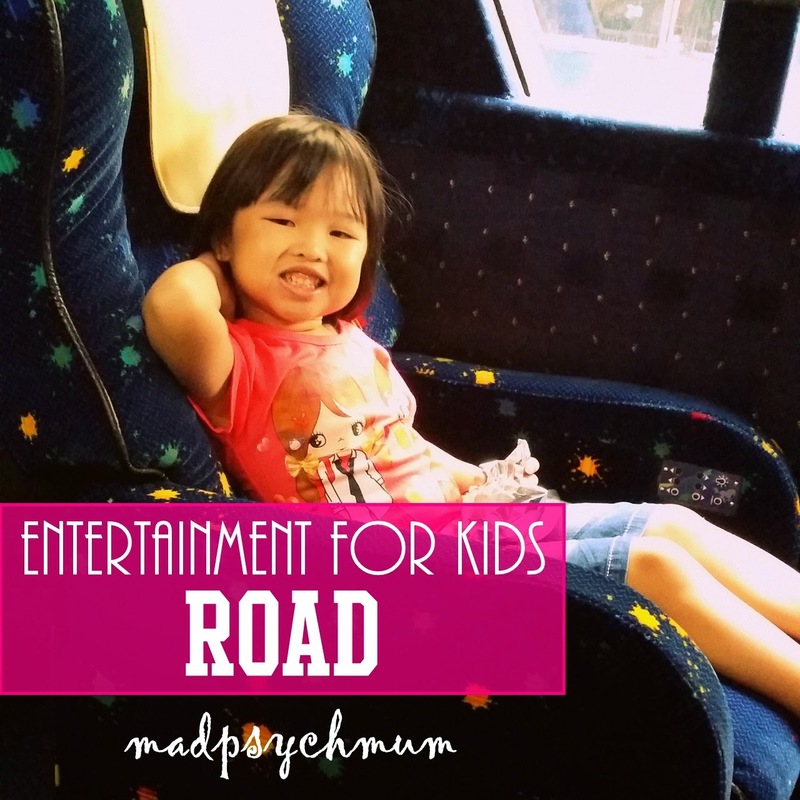 With the help of fellow mums from Singapore Mom Bloggers (SMB), we bring to you our top tips for entertaining your child on long flights and bus/car rides (the tips are organised by type of travel and age of the child). "Usually I only need to bring a pacifier to help with the air pressure and teething toys for my baby to bite on. Most of the time they are sleeping anyway; lucky for me, my kids love to sleep on the plane." "For young babies, we bring snacks (such as chewy biscuits), juices or milk to reduce any discomfort caused by changes in air pressure and keep them distracted from the travelling time." "People always say babies should have something to suckle when the plane takes off. If you bottle feed, don't pop the bottle into baby's mouth as soon as plane is on the runway. Sometimes it takes ages for the plane to take off and you wouldn't want to be stuck with an empty bottle then." "Snacks for the 14 months old to ease ear pressure when flight takes off and long road trips up the mountains." "It is not easy to entertain my attention-deficit girl but we try our best to bring a diverse number of things such as colouring books, stickers and even some toys to entertain her. However, despite all our preparation, sometimes all it takes is as simple as an empty cup and a small spoon. Kids.. (-_-)"
"If your child loves stickers but always has problems with peeling it off, peel off the entire background, leaving only the stickers so that it's easier for them to handle on their own (and you won't need to assist them all.the.time). We also love Crayola Color Wonder products because if the markers get on other objects it doesn't leave a mark. Or Aquadoodle kind of products." "When travelling with toddlers, bring lots of distractions but don't give them all at once. Space the toys/activities out and only take them out one by one so your kids won't tire of them all at the same time." "For my 4 year old, we bring along coloring books, puzzle books and storybooks." "For toddlers and pre-schoolers, prepare busy bags with sticker books, simple puzzle books, light weight storybooks, and a small pack of colour pencils so that she can self-entertain. If you're travelling on budget flights without any entertainment system, pre-load educational apps and multimedia storybook apps on the iPad. Here are some audio books that we like! On our recent trip to NYC, we brought along a child headphone set (on loan from our neighbour) which proved to be sooooo useful (as the regular ones given out by airlines are usually too big for kids and keep sliding off). She was able to enjoy the cartoons and kid-friendly movies throughout the flight." "Never be the first to board. Usually they announce for mothers with infants and kids to board first. However, after you board, 300 odd other people board. The kids will be super bored in confined spaces. Then they throw tantrums. Bad start to a trip." "For the 6 years old, we bring along a notebook, writing materials, portable IQ logic game set, washi tapes. Details found in my post on our trip to Taiwan." "For the older boys, bring along journals for writing their diary entries, composition, test papers or holiday homework, board games and story books." "You mean we need to prepare entertainment for the kids? Not for us. We make full use of the in-flight entertainment system. The kids got themselves busy throughout the flight. If on budget airline, we bring along an iPad." "When they were younger, we bring along photocopies of their favourite characters and twisted crayons for colouring. When they got older, i.e. above 7 years old, the in-flight entertainment will suffice. But I also encourage them to pack their own entertainment, such as a favourite book to read, travel games, or puzzles like Sudoku book." "My son has motion sickness, hence because of his condition, I did not dare to try long haul flights. Australia was the furthest we went. I have learnt that sniffing Lime/Lemon Essential Oil helps him. We forbid him to read or do any kind of writing during the flight so he listens to music or audio books, which can be downloaded for free at these websites: Loyal Books, Storynory and Audio Book Treasury. Sometimes, when the flight is more stable, he watches a movie or two." "My babies sleep almost the whole journey on the road (the movement almost always cause them to sleep immediately). When they are awake, we try to sing songs or play with them and distract them with the scenery outside." "For my 1 year old, my main long road trip tip would be: get them accustomed to the car seat, bring a familiar toy or blanket for them (make sure that it can be attached to their seat belt or else you will be contorting to pick up thrown stuff all the time) and well, my kid at least, will sleeeeeeep in bliss! "The mum-in-law also ensures that we bring her favourite biscuit and water bottle just in case she gets hungry in the car/bus. We also always have a CD with her favourite songs playing in the CD player so that we can sing her favourite songs together. If all else fails, there is always our handphones. Eventually she will be tired and will fall asleep like she always does." "1) Prepare snacks including fruits such as grapes, apples or dragon fruit. Biscuits get a little dry after a while so fruits are a healthier option and keep them hydrated. 2) Nap! Get them to sleep and you can sleep too. 3) Busy bags. I pack A4 size busy bags that contains books that the kids like, stickers, magnets and magnetic whiteboards. Erm, somehow my kids love to stick the magnets on the board and pull them out. Or stack them on top of each other. My magnets are the round kinds that you can get from Daiso. I paste stickers on them to beautify them." "Always plan to travel during nap times, play audio books when they are awake, bring plenty of snacks that have been split into small portions so that you don't have to keep handing out stuff (raisins, biscuits, drinks). They also like drawing on their boogie boards when bored, and it beats having to lug lots of paper. For those kids with food allergies, always bring anti-histamines just in case of flare-ups, and have plastic bags in the car for pee/puke emergencies or to contain trash." "For long road trips, plan a couple of stops in between just to get everyone recharged. It can be stopping for a toilet break or for a quick snack or two. If you are overseas where Milo is not available and yet your kid digs Milo like mine, remember to bring along a few sachets and hot water just in case. Back on the road, when the kid is not in the sleeping mood, play CDs with his/her favourite songs, shake to the beat with some maracas and have an in-car KTV session! "Raisins and nuts as snacks (a must have!) with a container for them to slooowly chew and Ribena/juice packs to relief hunger pangs. Play the "I Spy" game and get them to spot how many cars with a particular colour or brand, e.g. Proton in M'sia (my eldest goes cuckoo over counting them in his head) or describe the scenery or place to be. Provide lots of jotter/sketch books, pencils/markers for doodling and discussion and lots of mini picture books and card games. During the younger days, we used busy board and magnetic whiteboards to play with animal magnets and doodle." "We always start our journey before dawn like 3-4am, so the kids would sleep all the way till we reach Ipoh! We start at 3-4am but not before that. First, no jam at the customs (especially if you go during peak periods like over a long weekend). Second, won't get a speeding ticket as the police are still sleeping. Third, no kids asking, "are we there yet?" for the 405 time (they are also sleeping!). My hub drives as he has no problems with staying awake while he is on the wheel. I get to sleep too haha. We take about 5-6 hours to reach Ipoh; Penang is another hour north of Ipoh." "Things to bring: 1) iPad with kid-friendly headphones, 2) A5-sized notebook and crayons, 3) individual lunch bags filled with snack packs (raisins, fruit, crackers)." We hope these tips have been useful for you! Do you travel by air or road with your kids? What are your travel tips?